The First 100 Days of Obama was initiated as a drawing and journal project on January 20, 2009, the occasion of the inauguration of Barack Obama as the new President of the United States. For each day, Stephen Vincent—artist, poet and writer—created a journal account and a “haptic” drawing. 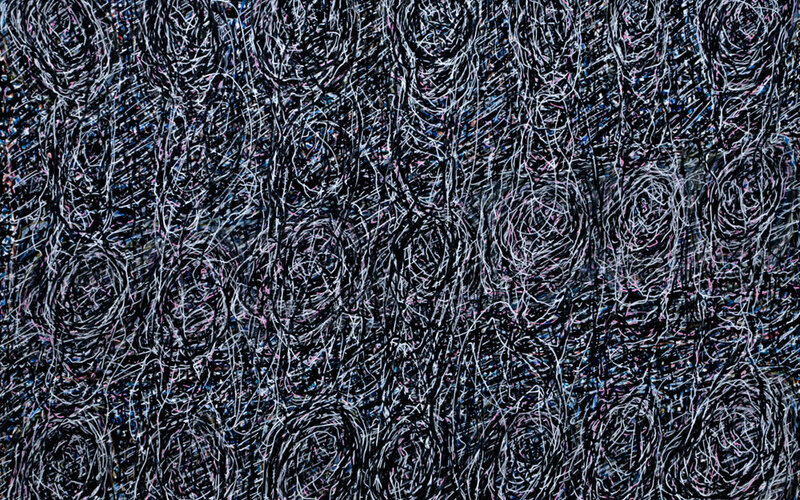 Made with pen and ink, the abstract marks emerged from a close listening to public and/or private sounds of the particular day. The original drawings and a printed volume, pairing the art and journal pages, were then gathered and shelved into a uniquely built silk, copper colored, bound box. See more on this project. In this parallel volume, the drawings are in color. Made with the aim of responding to the country’s pulse before and after the election of Donald Trump, the journal pages are further enriched by a thirty-day train trip. Approaching the writing and art work as if it were a national conversation, sites included those of historic significance: Chicago, Boston, Walden Pond, New York City, Gettysburg, Philadelphia, Washington, D.C, Atlanta among them. 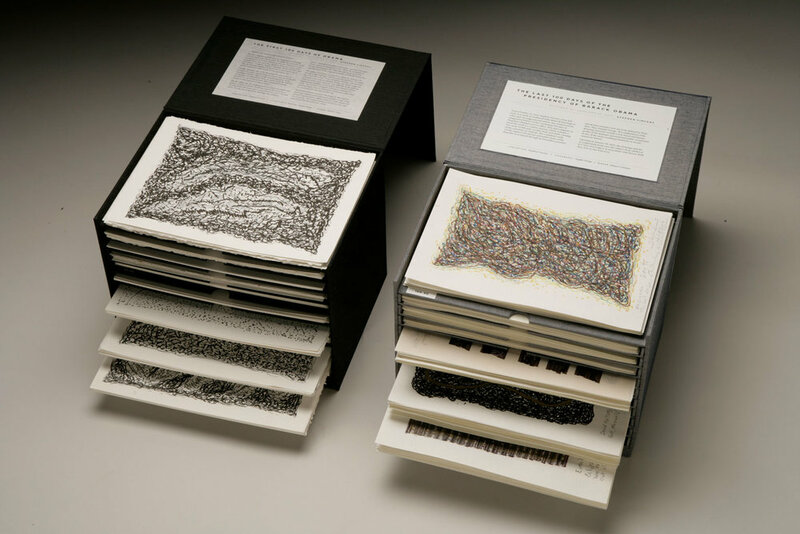 As with the first work, drawings and catalog are also shelved into a companion, into a silver silk bound, companion box. Haptic drawings, by definition, are what I call a conversation with paper. The smoothness or the granular resistance of different papers propel or contain different kinds of marks and textures. Sometimes I compare the involuntary waythe pens move to the magnetic pulls and stops of the planchette on a Ouija board. The drawing becomes a way of taking the pulse of a site and transforming that energy into an imaginative reading, or what may be called a poetry by other means. 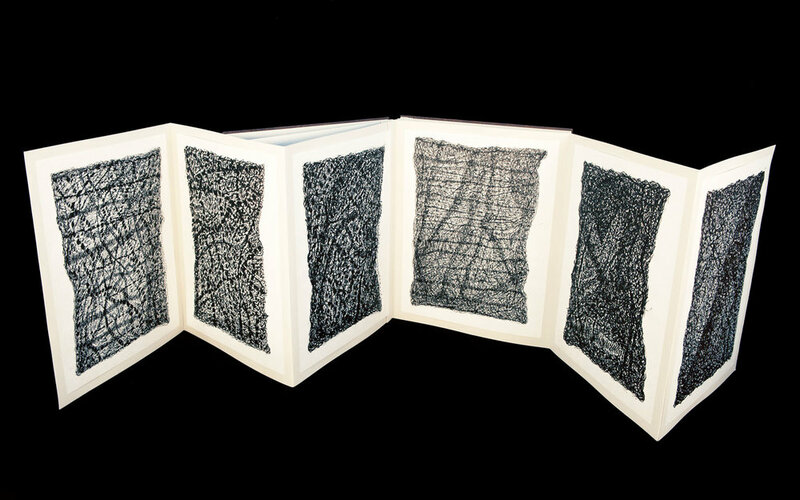 The works, abstract in form, are made on archival papers (often handmade Japanese ones) of varying sizes or are drawn directly into accordion fold books. Often done as time and/or walking-based projects, the haptics are made at sites that include urban street and country landscapes, various cities and countries, intimate domestic interiors, museum galleries, poetry readings, bars, musical performances.